By day, the sun graces the land, beaches and waters of Naples, the southernmost community along the posh southwest Florida coast. It’s a time to be active and enjoy a round of golf, a few sets of tennis or a day of fishing. Or, if a slower paced activity seems more appropriate, there are miles of white sandy beaches where you can relax and take a dip in the warm salty waters of the Gulf of Mexico. At night, dress for dinner can be casual or formal and the cuisine ranges from bar–b-que to gourmet. And for a nightcap, try a moonlight stroll along the beach or a romantic walk on Naples’ famous pier. 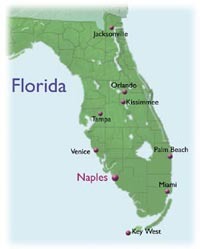 Naples is the heart of southwest Florida. From its roots as a sport fishing mecca, the region continues to grow adding boutique shopping, luxury accommodations, and cultural opportunities unsurpassed for a community of this size. The incredible natural beauty of the area balances the accent on culture. To the east are the Western Everglades, a mix of cypress swamps, wetland prairies and pine forests that are home to an array of wildlife that will delight anyone who enjoys the outdoors. The blending of nature, golf and the sophisticated life make Naples a great place to live and visit. Once the early settlers arrived and built homes along the banks of Naples Bay, they quickly discovered an abundance of fish in the brackish waters of the bay and the salt waters of the Gulf of Mexico. It wasn’t long before word spread and anglers arrived in search of the tarpon, snapper, grouper and other species. Today, sport fishing remains an important part of the local economy and anglers come from around the world to fish the mangrove-forested Ten Thousand Islands. In addition to tarpon, popular quarry includes snook, redfish, sea trout, pompano and sheepshead. 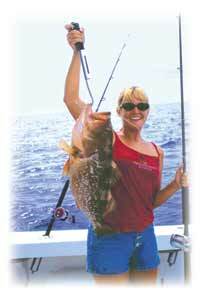 There are many qualified guides available for half or full day charters and the Naples Pier, a landmark in the community, is a place where many long time and new anglers meet to dangle a line in the water and try their luck. Enjoying nature continues to be a popular activity for residents and visitors. Looking for birds, manatees, dolphins or simply marveling at the unique southwest Florida landscape was a treasured pastime long before the eco-tourism became a household word. You could spend weeks exploring the region’s natural beauty and observing its wildlife, but here are six suggestions that will give you the best chance to see the most in the least amount of time. Everglades National Park is one of the crown jewels of the National Park Service. From Naples, it’s about an hour’s drive to the western gateway to the park in Everglades City. From the visitor’s center, there is a boat cruise among the mangrove islands. Dolphins, manatees and an assortment of birds are common sights. For the serious paddler, there is the 99-mile, six to eight day paddle on the Wilderness Waterway. The trip through the Park’s backwaters begins at the Everglades Visitor’s Center and ends at the Flamingo Visitors Center. To find out more, call Everglades National Park Boat Tours, the authorized concessionaire for the park at 1 800 445-7724 (US calls only). History and nature blend together at this state park south of Naples. The park has the only walking dredge left in the country. This unique piece of construction equipment was used to build the Tamiami Trail, the section of US 41 running from Miami to Tampa. The odd looking wheel-less dredge moved by lifting its legs and crawling forward a few feet at a time. For a tropical experience, try the Hammock Trail. Almost a mile long, the path winds its way through a tropical hardwood hammock featuring trees and plants normally found in the Caribbean Islands. A concessionaire operates a nature cruise from the park’s boat basin. The one-hour tour takes visitors down the Blackwater River and into the islands in search of herons, egrets, alligators and manatees. To find out more about the park programs and special events call the park office at 001 941 394-3397. For information on the boat tour call 1 800 842-8898 (US calls only). The Fakahatchee Strand is, in a practical sense, shallow, slow moving river inundated with cypress trees. Janes Memorial Scenic Drive, a hard packed limestone road (that’s south Florida’s version of a dirt road) cuts diagonally through the strand allowing motorists a chance to see the inside of a swamp from the comfort of their vehicle. The road is open from sunrise to sunset but a drive early in the morning or close to sunset offers visitors the best opportunities to see the wildlife. The swamp is home to deer, black bears, bobcats, otters, raccoons, snakes, alligators, wild turkeys, and the rare Florida panther, one of the most endangered species in the country. For more information or to make a reservation for a swamp walk, call the park office at 001 941 695-4593. If you like birds, then Audubon’s Corkscrew Swamp Sanctuary is the place to visit. There are close to 200 species of birds known to visit on a regular basis. One species that draws lots of attention are the wood storks. An endangered species, these large wading birds build large stick nests in the tops of the tallest cypress trees. Bring your cameras because the wildlife is accustomed to seeing people and it’s possible to have close encounters with birds, snakes, turtles and alligators. For more information call the Sanctuary visitor’s center at 001 941 657-3771. Where can I see an alligator? That has to be one of the most asked questions by visitors. These naturally shy creatures are abundant in the freshwater swamps of southwest Florida. A good place to look for them is in the canal along US 41 heading east from Collier Seminole State Park. They are most visible on sunny days when the gators will be catching a few rays along the banks of the canal. If you can find a place to safely pull off the two-lane road and get out of your vehicle, you can get a closer look. But, remember that it is illegal to feed alligators so enjoy the site and keep your snacks for yourself. Great fishing and the sandy white beaches graced by the tranquil waters of the Gulf of Mexico were the first drawing cards for Naples and vicinity. Catering to educated and sophisticated residents and visitors, Naples continues to grow with an accent on the finer aspects of life. Luxury Gulf front condominiums and lavish homes fostered the trendy shopping districts along Fifth Avenue, Third Street, and Venetian Village. Art galleries selling paintings of world-renowned and local artists and specialty stores that sell only the finest goods are testament to the refined clientele that live in and visit the area. Mixed in with the specialty shops are restaurants ranging from local seafood to the haute cuisines of Europe and Continental. Seafood lovers will especially enjoy Pelican Bend, one of the local’s favorites. This small family owned restaurant on the Isles of Capri is about 20 minutes south of Naples on the road to Marco Island. At the other end of the scale is the jacket and tie Lafitte Restaurant in the Registry Resort. For an ethnic taste, try Fernandez the Bull for Cuban, the Hofgarten Brauhaus for German, Yabbas for a taste of the Islands and The Pub on Linwood for English fare. Visitors will find accommodation ranging from the ultra-luxurious Ritz Carlton and Registry Resort to the charm of the Inn on Fifth and the Naples Beach Hotel and Golf Club with its newly opened full service spa. A benefit to staying at one of the larger hotels, are golf privileges at one or more private courses. With nearly 50 golf courses, Naples has the highest ratio of golf courses to golfers in the world. 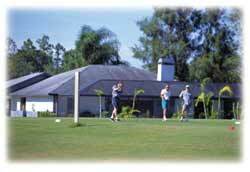 Most of the courses are private with membership limited to residents of the private, gated communities. Of course, there’s usually one or more homes or condos for sale if you’re interested. Several years ago, Naples enhanced its reputation with the construction of the Naples Philharmonic. A world-class facility, the Phil draws the top talent from around the world and features the Naples Philharmonic Orchestra. Keeping true to its roots, the area also boasts the world-famous swamp buggy races three times a year at the Florida Sports Park. Unique to south Florida, swamp buggies are one of the traditional means of traveling through the Big Cypress Swamp. Whether you want to spend your time in search of tarpon or golf balls, artwork or egrets, Naples is the gateway to the natural and cultural wonders of southwest Florida. Kris Thoemke is a 22 year resident of Naples. He frequently writes about fishing and the natural history of the area. You can contact him at kris@florida-outdoors.com.